Workspace Technology’s Fire Suppression System Maintenance service covers a complete range of fire suppression technology. Systems supported include VESDA early smoke detection, Novec, Pro-Inert, FM200 and other open standard systems fire suppression systems. Our Fire Suppression Maintenance services include both planned preventive and unplanned emergency callout support. Workspace Technology provides Fire Suppression System Maintenance service contracts to organisations across the UK. We can provide standalone Fire Suppression Maintenance or this can form part of an integrated service package including air conditioning, free cooling systems, chilled water, UPS, generator, fire suppression and associated mission critical infrastructure. In addition, our “optimised” maintenance service contracts can help improve operational performance, reducing energy costs allowing clients to focus on their core ICT services. All Planned Preventative Fire Suppression Maintenance is performed by competent and fully trained engineers. PPMs should be carried out throughout the life of the facility, helping identify worn or out of date parts, enabling pre-emptive replacement to take place prior to component failure. 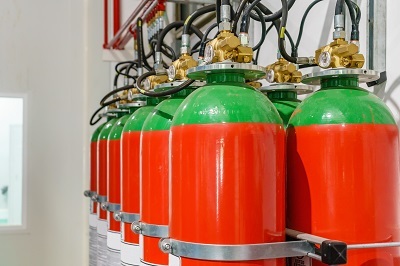 Regular PPM Fire Suppression System Maintenance will ensure fire suppression equipment is operating correctly with and inline with current British Standards. Planned Preventative Fire Suppression System Maintenance is undertaken according to manufacturer’s recommendations or legislation and will vary between equipment types. Where appropriate or included within the contract schedule consumables will also be replaced. Workspace Technology offers a 24 x 365 unplanned emergency Fire Suppression Maintenance callout service designed to provide onsite attendance, diagnostics and repair in the event of equipment failure in between planned service visits. Callout service levels of up to 4 working hours can be achieved at most locations on the UK mainland through our network of specialist fire suppression field service engineers. Fire Suppression Maintenance PPM visits should be performed twice per year in compliance with British Standards. Break glass units, bells or sirens and detection devices. Control panel, standby batteries electrical systems and fire alarm signals/relays connected to plant shutdown. Pressure gauges and associated devices. Hoses, actuation lines and firing mechanisms. Identify deviations of the British Standards or any hazards which may impair the performance of the fire alarm system. Issue a Certificate of Testing and Inspection on completion of each service visit. The maximum validity of any room Integrity Test is 12 months. This validity is reduced if any works likely to affect the room integrity are carried out. Workspace Technology recommends an annual room Integrity Test as part of the Fire Suppression Service Contract. Fire suppression gas bottles require hydrostatic re-testing and recertification by the manufacturer every 10 years. The hydrostatic retesting process involves the removal of your fire bottles, return to manufacturer where the gas is removed, bottles pressure tested and then re-gassed and recertified for a 10-year period. Click here to view our Fire Suppression Maintenance Service Schedule. For more information on our full range of Data Centre Fire Suppression System Maintenance Services please contact our sales team on 0121 354 4894 or send us a message.